TMP is definitely a power track. Between T1 and T2 was enough to put me about 1.75 seconds behind a higher HP car (green had around 130 more whp than me). I also lose out pretty big on the middle straight between T6-T9 and obviously the main straight. Even vs. a car with similar power-to-weight ratio as mine running the same tires, I lost 1 second between T1 and T2. I am way late on the power at exit. T1 is definitely my weakest corner and something I need to work on for 2013. The "in-field" section of Turns 3,4,5 seems to be my strong point vs. these 2 drivers since I am actually making up a few tenths here. I downshift to 2nd whereas orange holds it in gear and seems to float (never good to float). I have a much different line through T10. Instead of making an "S" over to the left I keep my car straight and take T10 with an "inside-inside" approach. I have a longer time to accelerate between T9 and T10 but my cornering speed is sacrificed due to my smaller entry radius. Is it worth it? Against both drivers the answer is "marginally". I gain less than a tenth here against both drivers. The best experiment would be to run it against myself and then compare. 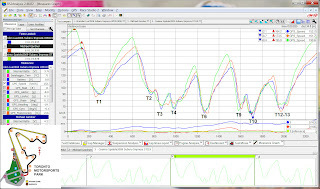 Edit: Just wanted to make a note that I manually synced up all the start/finish lines so the graphs lined up. 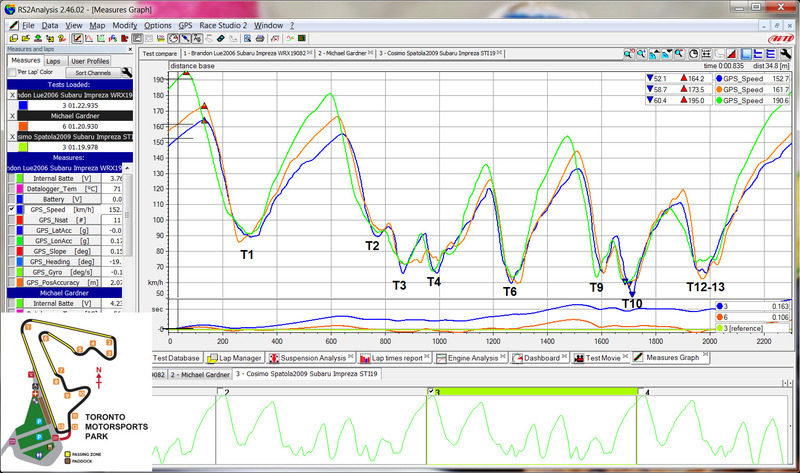 And also my acceleration line appears a bit jagged because I was running with a broken ringland that day.